The Berwick Voluntary Centre is easily accessible for public transport links and within a short walk from the historic town centre. 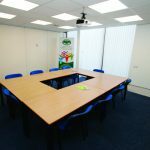 The centre has a range of rooms available to hire depending on needs; from mediation and counselling in a comfortable and welcoming environment to board room settings for professionalism. 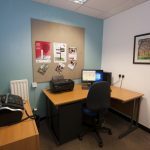 A “hot-desk” office is also available to hire if you find yourself either working away from your regular base or volunteering for a charity or community group. • Conference Room can seat a maximum of 25 people comfortably and can be set in various configurations – cafe style, boardroom, and cinema or lecture layout. The conference room can also be extended to increase the seating capacity to 40 people. • “Hot-Desk” office – this room can seat up to 3 people and is equipped with all your office needs and is an ideal working environment away from your usual base. Free wifi, latest IT equipment, printer, fax and shredder. 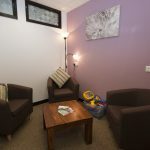 • Mediation & Counselling Room – offers a comfortable and welcoming environment. Soft furnishing for 3 people in a calm and secure setting. If you would like information about hire charges or to book a room please contact us on 01289 304141, email us on hello@nnvforum.org.uk or fill in the form below and someone will get back to you.